In a time when the need for and the relevance of the Gospel has seldom been greater, the relevance of the church has seldom been less. The Shaping of Things to Come explores why the church needs to rebuild itself from the bottom up. 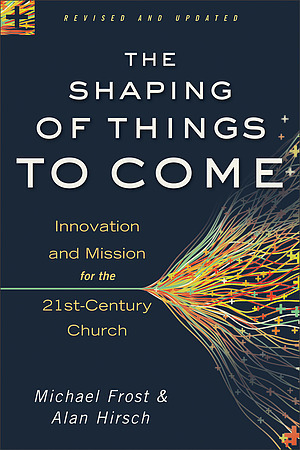 Frost and Hirsch present a clear understanding of how the church can change to face the unique challenges of the twenty-first century. This missional classic has been thoroughly revised and updated. The Shaping of Things to Come by Alan Hirsch; Michael Frost was published by Baker in March 2013 and is our 20572nd best seller. The ISBN for The Shaping of Things to Come is 9780801014918. Be the first to review The Shaping of Things to Come! Got a question? No problem! Just click here to ask us about The Shaping of Things to Come. Christendom is dying and needs to be removed from its life-support system. Starting with this frank assessment of the current church, Michael Frost and Alan Hirsch present an alternative model for ministry in today s postmodern world. Instead of mourning the demise of the Western church as the center of society, the authors explain how the church can be reborn through incarnational mission, messianic spirituality, and apostolic structure. Church leaders who heed the authors call will see death turned into new life through the creation of a vital, missional church. Alan Hirsch is founding director of Forge Mission Training Network and cofounder of Shapevine.com, an international forum for engaging with world-transforming ideas. Currently he leads an innovative learning program called Future Travelers which helps megachurches become missional movements. He is the author of numerous books, including The Forgotten Ways, and coauthor of Untamed and Right Here, Right Now. Hirsch lives in the Los Angeles area. "This book may shock the traditionalist, but the Billy Graham style outreach no longer brings in the seekers. Why? because over the last 20 years the culture has changed. Without compromising the Gospel, this book analyses the cultural changes and suggests new ways to engage culture with examples of successes. We expect people to come to church, but this book is encouraging Church to go to the people, to get out of our comfort zones, and really think what Christendom has created and how this is a barrier to effective evangelism. This book will challenge the reader and may disturb the vicar who is often entrenched in a comfort zone of traditionalism." - Other Retailer's Reveiwer. "[Frost and Hirsch s] contribution brings an in-depth theological reflection as well as providing a broad scope informed by their extensive reading in theology, culture and mission as well as their on-site visits to missional churches in the USA and the United Kingdom." - Eddie Gibbs, Donald A. McGavran Professor of Church Growth, Fuller Theological Seminary. "This book is a bountiful multi-course meal, each serving presented with charm and class. It will satisfy even eclectic appetites, and please the most discriminating palates. Four Stars." - Leonard Sweet, Drew Theological School, George Fox University. Edition Revised & updated ed.